Here's what we know and what's still unclear about the health benefits of this nutrient that Americans aren't getting enough of. The 2015–2020 Dietary Guidelines for Americans identified vitamin E (specifically, the form known as α-tocopherol) as a "shortfall nutrient"; in a general sense, more than 90% of Americans don't meet the estimated average requirement. Still, clinical deficiencies in the United States are rare but are believed to be more common in other countries. Vitamin E was discovered in 1922, but it wasn't until the 1980s that vitamin E deficiency was identified as a condition in humans. It took almost another decade before deficiency symptoms were recognized. Vitamin E is found naturally in several foods, including wheat germ, acai berries, avocados, almond milk, sunflower seeds, almonds, peanut butter, and safflower oil. Other sources include tomatoes, spinach, asparagus, Swiss chard, and broccoli. Naturally occurring vitamin E (tocopherol) exists in eight chemical forms (alpha-, beta-, gamma-, and delta-tocopherol, and alpha-, beta-, gamma-, and delta-tocotrienol). Natural vitamin E (d-α-tocopherol) and synthetic vitamin E (dl-α-tocopherol) are both found in some supplements. Alpha-tocopherol is believed to be the only form that meets the requirement for vitamin E, though tocotrienols and γ-tocopherol are thought to be better scavengers of free radicals than α-tocopherol.3 In the body, α-tocopherol is preferentially retained in the liver, which incorporates the vitamin into lipoproteins for delivery to body tissues. However, other forms of vitamin E also are actively metabolized and excreted. • To convert from mg to IU: 1 mg of α-tocopherol is equivalent to 1.49 IU of the natural form or 2.22 IU of the synthetic form. • To convert from IU to mg: 1 IU of the natural form is equivalent to 0.67 mg of α-tocopherol. 1 IU of the synthetic form is equivalent to 0.45 mg of α-tocopherol. While natural vitamin E often is viewed as being the better option, according to Tod Cooperman, MD, president and founder of ConsumerLab.com, a company that provides independent test results, reviews, ratings, and comparisons of vitamins, supplements, and herbal and nutrition products for consumers, "Both natural and synthetic vitamin E in the proper doses can be equally effective." However, he says, "It takes more IUs of synthetic vitamin E than natural vitamin E to get an equivalent amount of the active vitamin, but it also takes fewer IUs of synthetic vitamin E to cause potential bleeding problems when high doses are used." "Throughout my practice, I have yet to find a patient that needed vitamin E supplementation," says Kristen Smith, MS, RDN, LD, a spokesperson for the Academy of Nutrition and Dietetics. "Typically, if a patient is suspected of being deficient in vitamin E, other micronutrient deficiencies are present and a multivitamin is best suited for them." The patient's primary care physician can order blood tests to determine vitamin E levels, but this isn't a blood test that's routinely administered. If cost or lack of insurance is a factor, a food journal should reveal whether vitamin E intake is inadequate. Because of its ability to neutralize free radicals, vitamin E has been suggested to possess anticancer properties by virtue of its ability to protect cells against oxidative damage. However, large prospective cohort studies have failed to show significant associations between dietary and supplemental vitamin E intake and the incidence of lung or breast cancer.19 More recently, the prospective VITamins And Lifestyle (VITAL) study evaluated the association between the use of supplemental vitamins over 10 years and the risk of lung cancer in more than 77,000 men and women.20 No relationships were reported between intake of multivitamins, vitamin C, vitamin E, or folate and the risk of lung cancer. 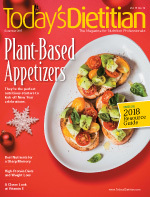 However, the use of supplemental vitamin E in current smokers, but not in former smokers, was associated with an 11% increased risk of lung cancer for every 100 mg per day increase in vitamin E intake, and intakes greater than 215 mg per day were specifically linked to a 29% increase in risk of nonsmall-cell lung cancer. It also has been suggested that vitamin E supplements might reduce colon cancer risk. However a meta-analysis of four placebo-controlled trials found no evidence that vitamin E supplementation reduces colorectal cancer risk.21 To date, most clinical trials have failed to find any beneficial effects of vitamin E supplementation on the risk of various cancers.4 Overall, observational studies haven't found vitamin E, either from food or supplements, to offer protection against cancer. Little evidence is conclusive about the effects of vitamin E on health, other than that a clinical deficiency can result in illness and eventually death. Experts agree that more research is needed to determine whether supplemental vitamin E is beneficial and in which form and at what dose. Most multivitamins provide adequate amounts of vitamin E that equal or exceed the RDA. Traber says that until additional findings are evaluated, "A multivitamin will provide the RDA not only for vitamin E but other vitamins as well; that is my preference over a single vitamin E pill." 1. Niki E, Traber MG. A history of vitamin E. Ann Nutr Metab. 2012;61(3):207-212. 2. Rizvi S, Raza ST, Ahmed F, Ahmad A, Abbas S, Mahdi F. The role of vitamin E in human health and some diseases. Sultan Qaboos Univ Med J. 2014;14(2):e157-e165. 3. Brown KM, Morrice PC, Duthie GG. Erythrocyte vitamin E and plasma ascorbate concentrations in relation to erythrocyte peroxidation in smokers and nonsmokers: dose response to vitamin E supplementation. Am J Clin Nutr. 1997;65(2):496-502. 4. Vitamin E. Oregon State University, Linus Pauling Institute, Micronutrient Information Center website. http://lpi.oregonstate.edu/mic/vitamins/vitamin-E. Accessed October 11, 2017. 5. Traber MG. Vitamin E inadequacy in humans: causes and consequences. Adv Nutr. 2014;5(5):503-514. 6. Leonard SW, Bruno RS, Ramakrishnan R, Bray T, Traber MG. Cigarette smoking increases human vitamin E requirements as estimated by plasma deuterium-labeled CEHC. Ann N Y Acad Sci. 2004;1031:357-360. 7. Booth SL, Golly I, Sacheck JM, et al. Effect of vitamin E supplementation on vitamin K status in adults with normal coagulation status. Am J Clin Nutr. 2004;80(1):143-148. 8. Pastori D, Carnevale R, Cangemi R, et al. Vitamin E serum levels and bleeding risk in patients receiving oral anticoagulant therapy: a retrospective cohort study. J Am Heart Assoc. 2013;2(6):e000364. 9. Hendler SS, Rorvik DM. PDR for Nutritional Supplements. 2nd ed. Montvale, NJ: Thomson Reuters; 2008. 10. Jiang Q, Christen S, Shigenaga MK, Ames BN. 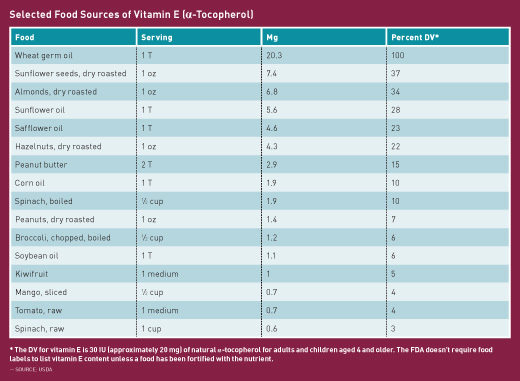 gamma-tocopherol, the major form of vitamin E in the US diet, deserves more attention. Am J Clin Nutr. 2001;74(6):714-722. 11. Mah E, Sapper TN, Chitchumroonchokchai C, et al. α-Tocopherol bioavailability is lower in adults with metabolic syndrome regardless of dairy fat co-ingestion: a randomized, double-blind, crossover trial. Am J Clin Nutr. 2015;102(5):1070-1080. 12. Ahsan H, Ahad A, Iqbal J, Siddiqui WA. Pharmacological potential of tocotrienols: a review. Nutr Metab (Lond). 2014;11(1):52. 13. Constantinou C, Papas A, Constantinou AI. Vitamin E and cancer: an insight into the anticancer activities of vitamin E isomers and analogs. Int J Cancer. 2008;123(4):739-752. 14. Fu JY, Che HL, Tan DM, Teng KT. Bioavailability of tocotrienols: evidence in human studies. Nutr Metab (Lond). 2014;11(1):5. 15. Knekt P, Reunanen A, Järvinen R, Seppänen R, Heliövaara M, Aromaa A. Antioxidant vitamin intake and coronary mortality in a longitudinal population study. Am J Epidemiol. 1994;139(12):1180-1189. 16. Kushi LH, Folsom AR, Prineas RJ, Mink PJ, Wu Y, Bostick RM. Dietary antioxidant vitamins and death from coronary heart disease in postmenopausal women. N Engl J Med. 1996;334(18):1156-1162. 17. Rimm EB, Stampfer MJ, Ascherio A, Giovannucci E, Colditz GA, Willett WC. Vitamin E consumption and the risk of coronary heart disease in men. N Engl J Med. 1993;328(20):1450-1456. 18. Stampfer MJ, Hennekens CH, Manson JE, Colditz GA, Rosner B, Willett WC. Vitamin E consumption and the risk of coronary disease in women. N Engl J Med. 1993;328(20):1444-1449. 19. Institute of Medicine, Food and Nutrition Board. Dietary Reference Intakes for Vitamin C, Vitamin E, Selenium, and Carotenoids. Washington, D.C.: National Academy Press; 2000. 20. Slatore CG, Littman AJ, Au DH, Satia JA, White E. Long-term use of supplemental multivitamins, vitamin C, vitamin E, and folate does not reduce the risk of lung cancer. Am J Respir Crit Care Med. 2008;177(5):524-530. 21. Arain MA, Abdul Qadeer A. Systematic review on "vitamin E and prevention of colorectal cancer." Pak J Pharm Sci. 2010;23(2):125-130. 22. Rumbold A, Ota E, Hori H, Miyazaki C, Crowther CA. Vitamin E supplementation in pregnancy. Cochrane Database Syst Rev. 2015;9:CD004069. 23. Farina N, Llewellyn D, Issac MG, Tabet N. Vitamin E for Alzheimer's dementia and mild cognitive impairment. Cochrane Database Syst Rev. 2017;1:CD002854. 24. Barnard ND, Bush AI, Ceccarelli A, et al. Dietary and lifestyle guidelines for the prevention of Alzheimer's disease. Neurobiol Aging. 2014;35(Suppl 2):S74-S78. 25. Schürks M, Glynn RJ, Rist PM, Tzourio C, Kurth T. Effects of vitamin E on stroke subtypes: meta-analysis of randomised controlled trials. BMJ. 2010;341:c5702.